I have been waiting all week for this night! 1. Emily and Shawn were coming for dinner! 2. 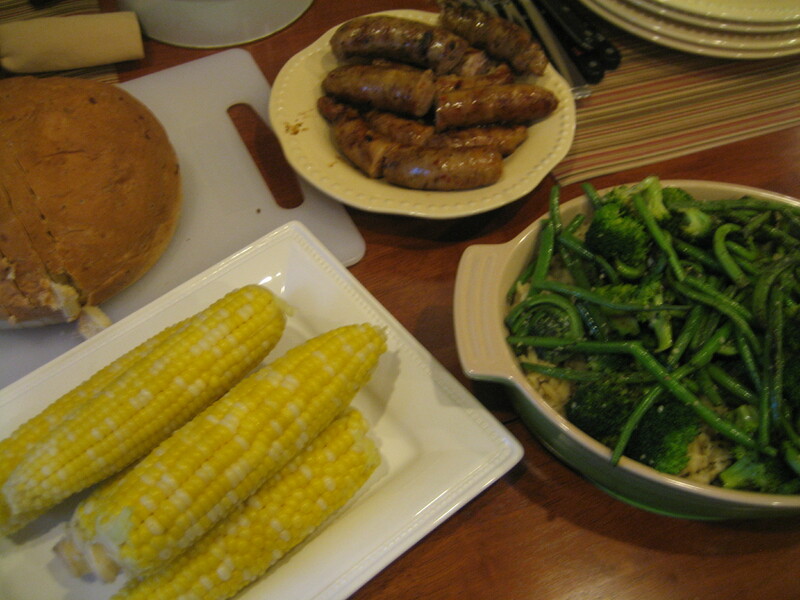 I got to cook my fiddleheads!! 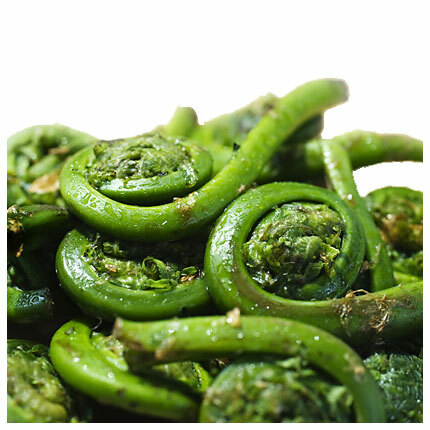 Have you ever had fiddleheads? I love fiddleheads! They are an antioxidant powerhouse! They are only around for so long each spring, so I always feel like I really need to get them in. However, I have never cooked them before. I have ordered them at restaurants, but it just isn’t the same as cooking with the delicious veggie. Since I had no idea how to cook them, I did some research first. 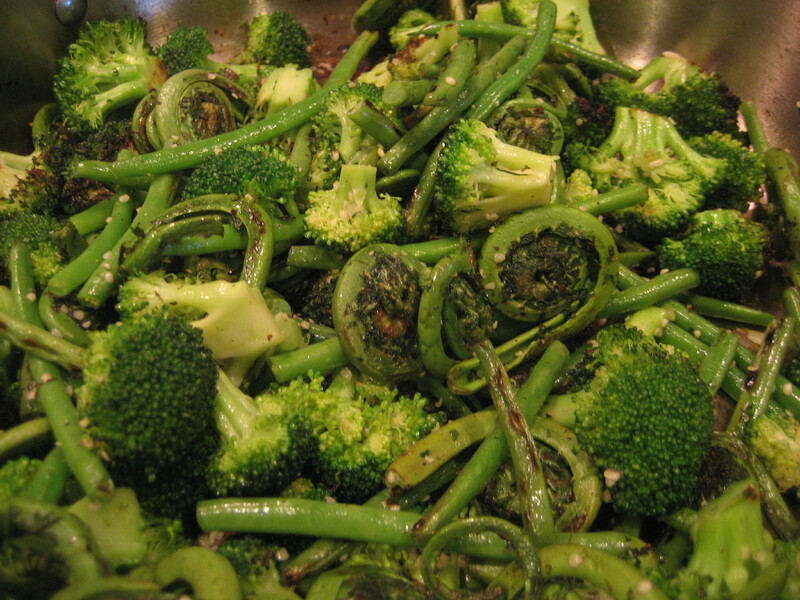 From About.com: Fiddleheads are a New England spring delicacy. 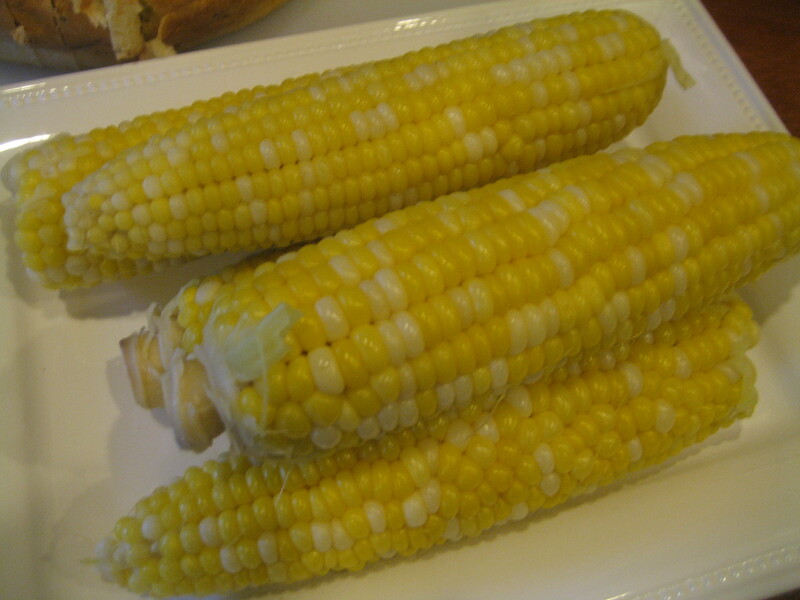 They appear on menus and in markets in the region from about May through early July. What exactly are these deep green, coiled vegetables, though? Fiddleheads are actually young fern fronds that have not yet opened up. They must be picked during a two-week window before the fern unfurls. 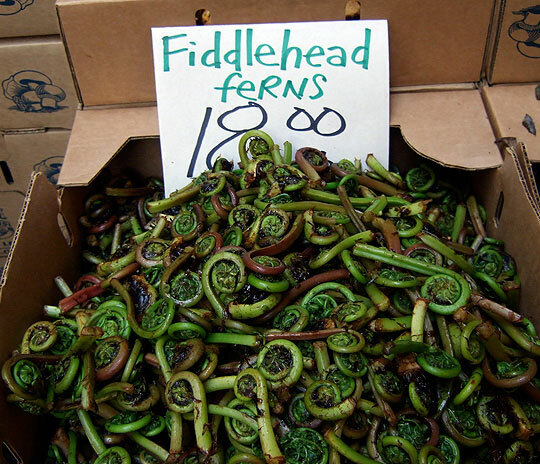 Fiddleheads are named for their appearance, which resembles the scroll at the head or top of a fiddle. 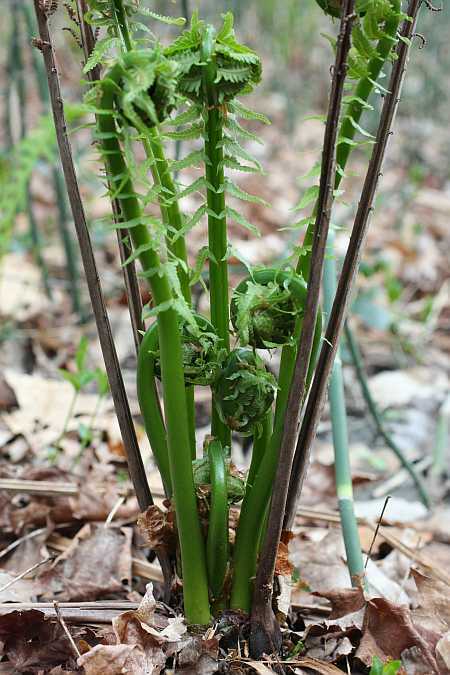 The ostrish fern is the species that produces these edible shoots, which have a unique texture but taste a bit like asparagus or okra. 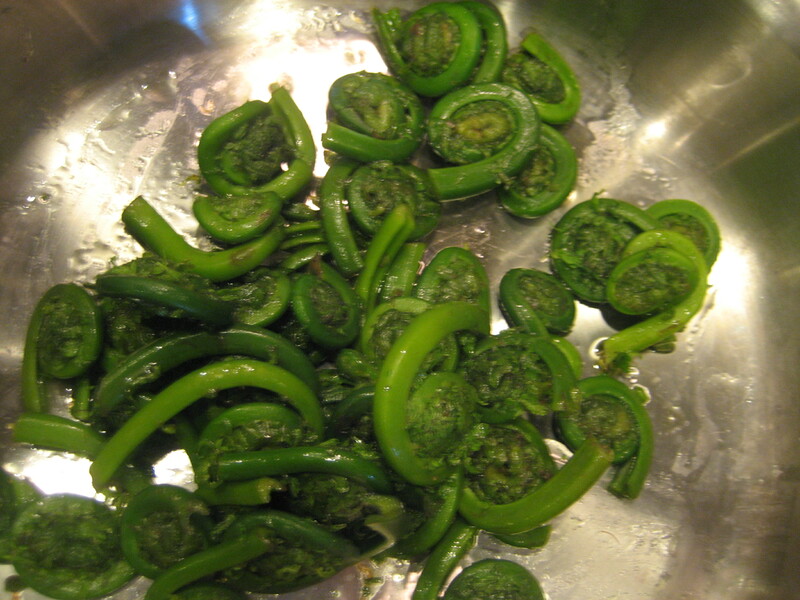 Fiddleheads can be consumed raw or cooked. I have heard mixed reviews about whether or not it is important that fiddleheads are scrubbed clean and fully cooked before consumption. Some say that they could cause a form of food poisoning if consumed raw, while others say raw is fine. Does anyone know which is true? To be safe, I made sure to fully cook them. I cut off all of the brown tips, which occur due to oxidation (similar to an apple that has a bite out of it turning brown). Then, put the greens in a strainer and rinsed for a few minutes. 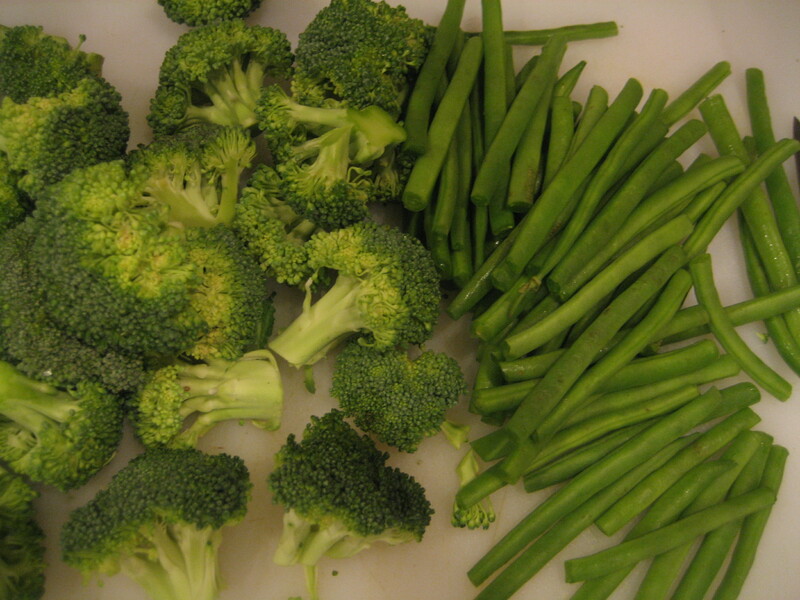 I then placed the greens into a bowl filled with water and swirled them around and rinsed 2 or 3 times. While swirling them around I ‘scrubbed’ each fiddlehead with my fingers to remove any loose pieces. I added them to a saute pan over medium-high heat with a little water and covered to steam them for 5-6 minutes. After steaming, I added a bit of olive oil and sauteed for 5-6 minutes until tender, but still with a bit of crunch. 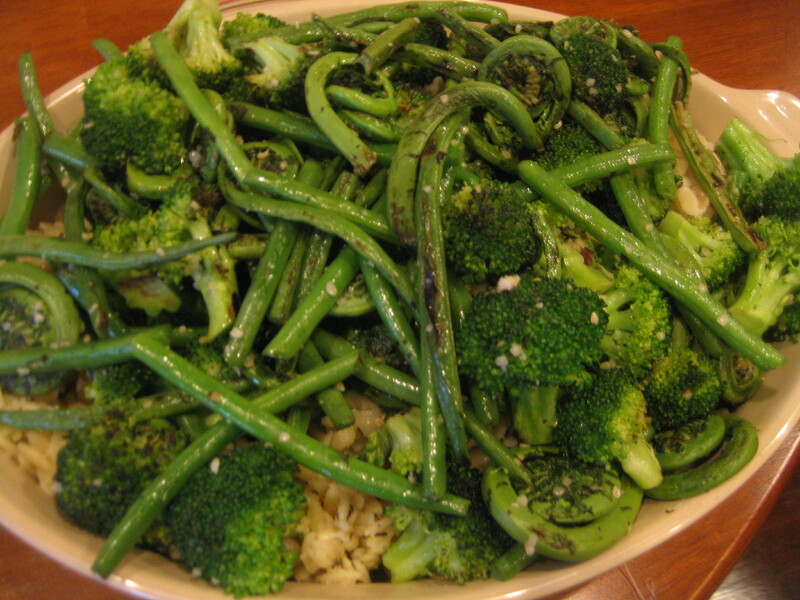 I set my fiddleheads aside and sauteed some broccoli and french greens beans in a little olive oil. 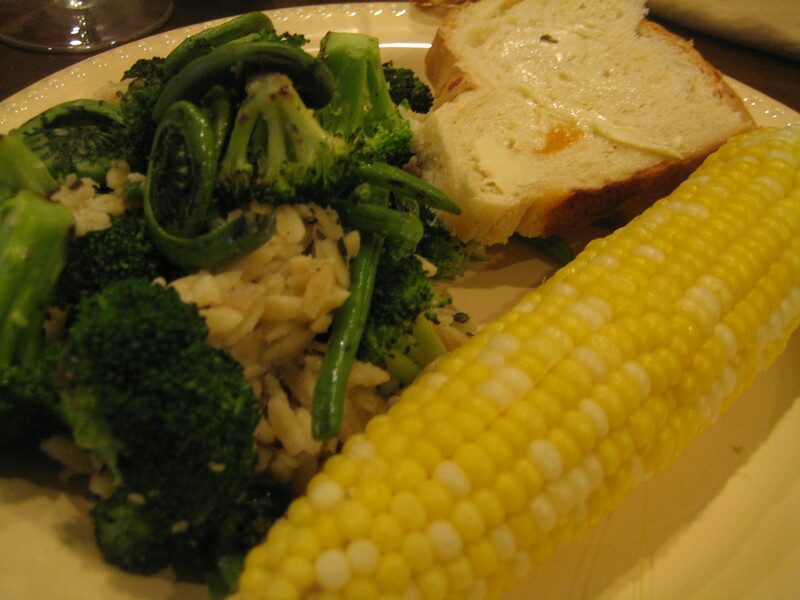 After they were cooked, I tossed in the fiddleheads along with some hemp seeds! 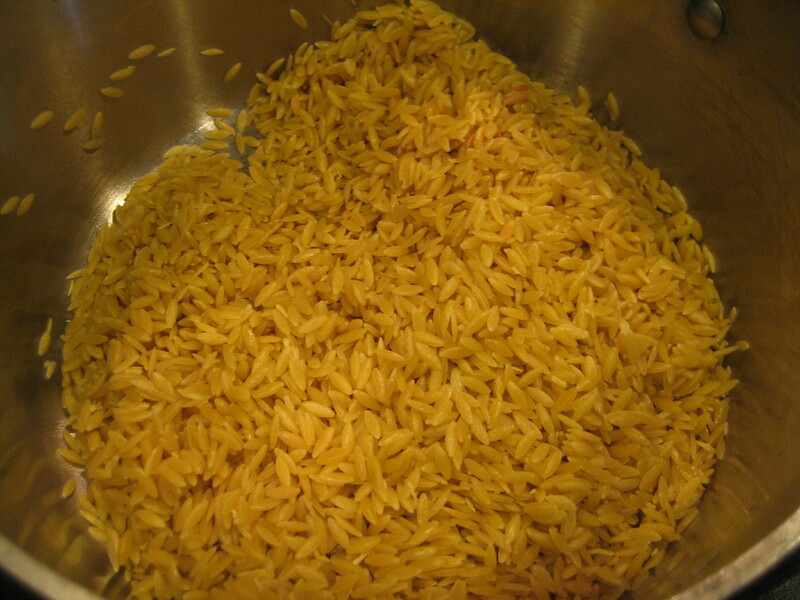 I served my greens over some orzo, which was cooked with a little butter and salt. Then sprinkled with basil and Parmesan cheese. 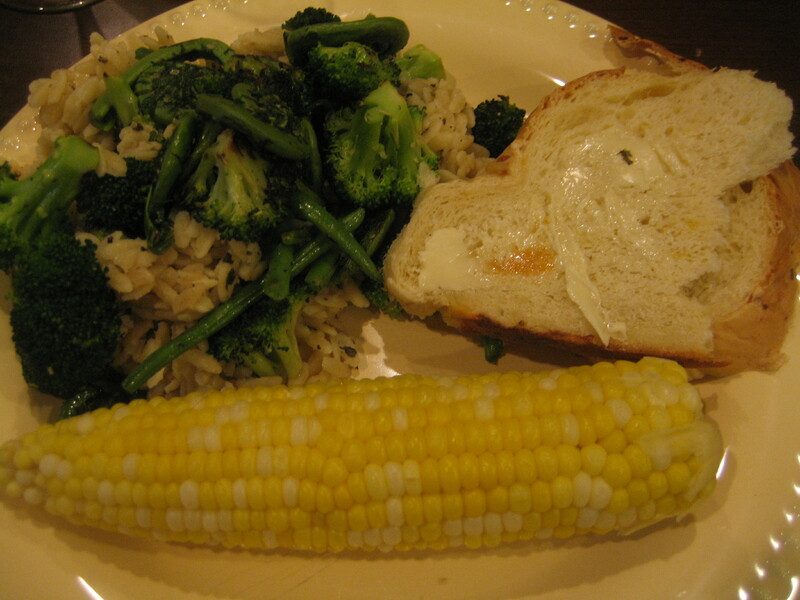 While I was making the orzo and greens, Brant worked on cooking the corn on the cob (our first of the season!) and some chicken sausage. 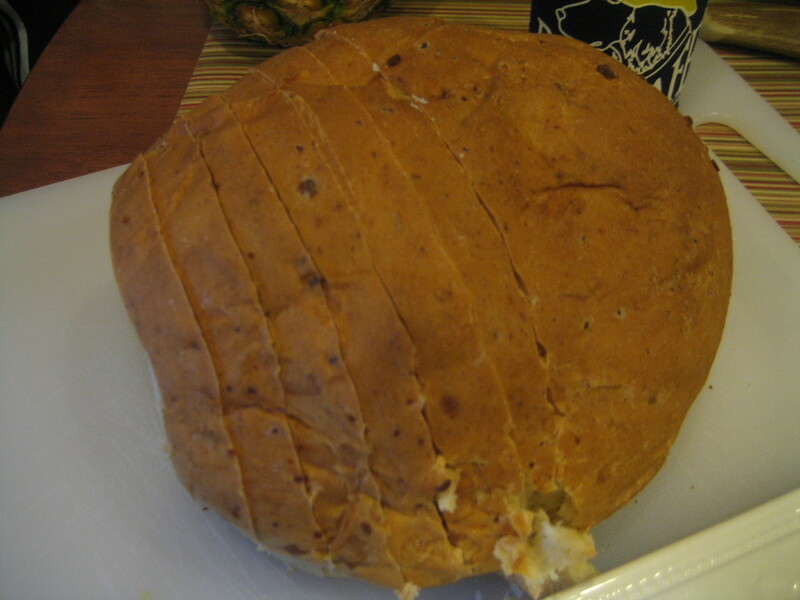 And, some Great Harvest Cheddar Garlic bread! 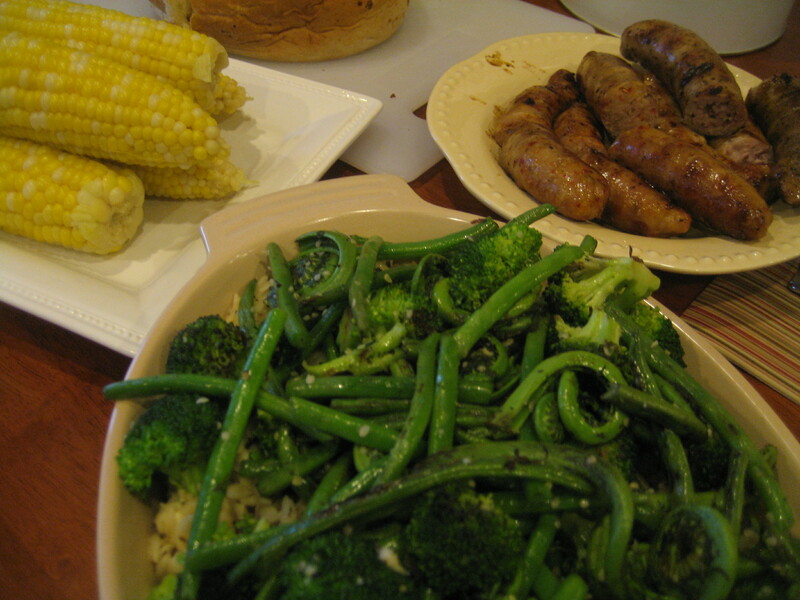 I skipped the chicken sausage, and piled up the fiddleheads! I was craving some veggies after eating random snacks all day long instead of an actual real meal…I hate days like that! I never feel full and satisfied. But, a nutritious dinner always helps with that. Friday nights with a delicious home cooked meal are the perfect end to a long work week…and the perfect start to a weekend! Am cooking fiddleheads tonight, grilling them on a salt block Bridget got us, along with saome salmon.